Realised it's going to take a while to track down those threads, so thought I'd make a quick list here of now accepted translations for quick reference if anyone's interested, and then find the threads afterwards. Others that want to post their accepted translations here are more than welcome. Why some emails are in French and Spanish? Porque todavía están hablando de inglés. Sólo curioso. I've had several hundred emails from the Chinese course since I started it in the alpha test, and I'm still getting several every other day or so, so they certainly seem actively to be dealing with reports. The improvement in accepted translations for earlier skills is very apparent when using timed practice, too (there's still much to be done with many of the longer sentences, however). 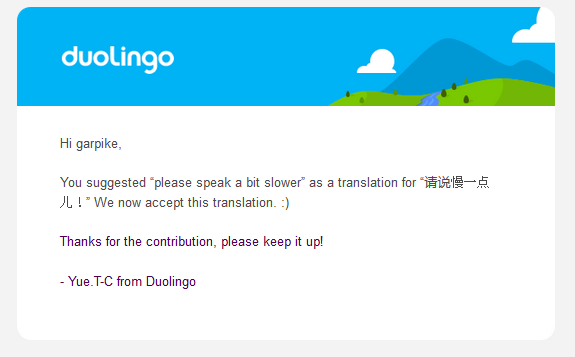 I had always assumed only the first user to suggest a translation gets an email, but evidently not. Finally I know that we all get the same message when we make the same report. I think I shared at least two with you too. Anyway I counted my messages and I'm only at 16 so far. Yep, we are actively adding more translations (especially to the later skills) and at the same time trying to get to reports from the first half. Thanks for sending in the reports, it makes adding alternative translations much easier! And no need to post the accepted translations in the sentence discussion thread, ideally all correct translations will be accepted (we're working on it! ), so hopefully we can keep discussion there to questions about the sentences themselves. How do I make a suggestion? I did it as a bug but I am not sure that will get through. I hope someone has pointed out that the plural of “you” in English is “you” and not “you guys”. “You guys” is slang and inappropriate or rude in many cases. Also, we do not say “two morning” to mean “two a.m.” It should be “two in the morning” . Duo won’t let me proceed until I give your wrong answer, i.e. “two morning.” Pretty frustrating. 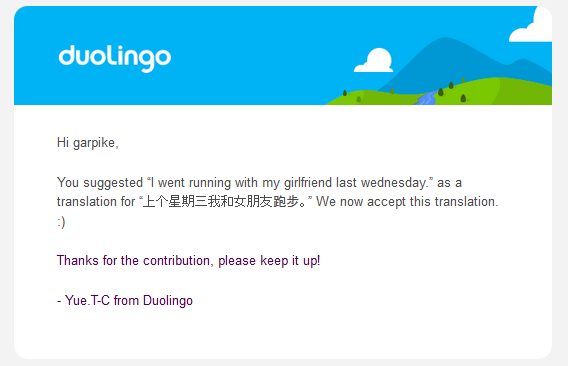 Glad Duolingo offers Chinese now.